Construction on the wading pool outside City Hall. Construction on the 27-year-old wading pool outside city hall started last Spring. A project some, including Ward 11 Councillor Mike Nickel, opposed. “And this was an inner city amenity for a lot of kids that don’t have access to these public pools that are out there in the suburbs and so on,” said Nickel. The renovations were required to meet new building code and provincial health standards. The pool will be shallower and the original cost was estimated at $13 million. “Here it’s over schedule slightly and it’s over budget,” said Nickel. Construction bids came in higher than expected due to the market and tight timeline to get the project finished. The project was expected to be finished in May. City staff maintain the project is on schedule, though a new report said it is one to two months behind schedule. Despite his frustration, Nickel said it’s a small setback compared to other issues the city has had with projects like the LRT and bridges. “Unfortunately it’s just the pile on effect that people just go, ‘another one.’ And I guess that’s where it’s going to fall into,” he said. Instead of opening next month, officials said the wading pool will likely open sometime in June or July. 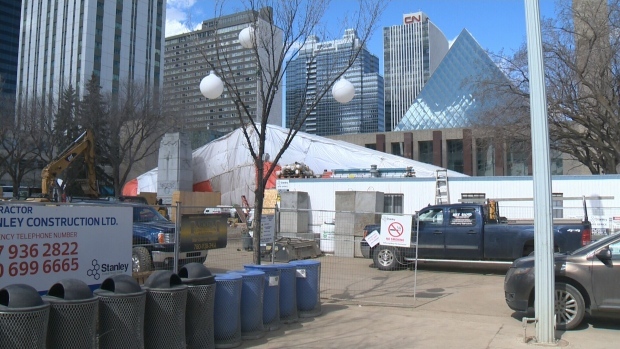 That delay, along with other major construction projects nearby means the four major festivals – Taste of Edmonton, Street Performers Festival, The Works and Cariwest – will not return to Churchill Square this summer. “We asked whether they wanted to return this year with all this work going on and they elected to return to their alternate locations for 2019,” said Mark Torjusen, senior communications officer with the City’s Communications and Engagement Department. “We will welcome them back in 2020,” he added.